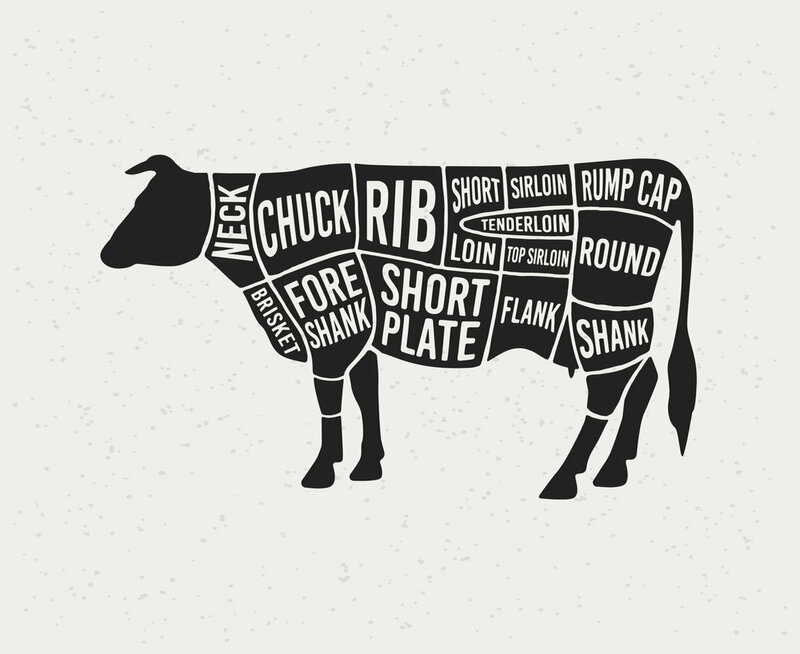 You are in the driver's seat – you make the decisions on how to cut your animal (beef, lamb, or pig)! We will advise/assist you if needed, but you get your animal (beef, lamb or pig) cut like you want it, the cuts your family eats not the ones they don't! Also all the pieces and parts you want ... all of it is yours, everything you want including organs and fat if you want it, we will even give you a discount on the fat & bones ($3 per pound), if you don't then don't worry we don't charge you for it! This is a great way for you and your family to get a great deal on healthy, 100% grass-fed/finished beef, Pastured Hog or Grass Fed / Grass Finished Lamb! If you order a quarter beef (does NOT apply to hogs or lamb), you will split a side with another customer. The cuts of meat in the front half are different from the back half, so in order to give you all the cuts we "share" these so you get “some of everything”. This could limit your cutting options, as it is a compromise with the other customer, who will be sharing the half, but we do our best to match you in regards to steak thickness and packaging requested. Again, this applies only to quarter orders. If you ordered a half or whole beef, you won’t have to split the sides and you are in full control. Step 1: Place your order with a $200 deposit for beef & hogs or $100 deposit for lamb. Step 2: Your beef will be delivered to the butcher and aged from two to three weeks depending on the weight of the animal, pork & lamb are cut as soon as they reach cutting temp (1-3 days). Step 3: You will receive information for cutting instructions to the butcher and we will walk you through that process. Step 4: After butchered, we will contact you with exact hanging weight and an estimated total cost. Step 5: You will pay the remainder of your balance to Buck Creek once we know the packaged weight, and can pick-up your meat or it will be delivered or shipped depending on your arrangement. Costs for a processed (to your specifications & vacuum sealed) whole beef that would yield between 480 - 500 pounds of package beef to your freezer @ $8.00 would cost you $3,840 - $4,000. Costs for a processed a half beef that would yield between 240 -250 pounds of package beef to your freezer @ $8.00 would cost you $1920 - $2,000. Costs for a processed a quarter beef that would yield between 120 -125 pounds of package beef to your freezer @ $9.00 would cost you $960 - $1,000. Costs for a processed (to your specifications & vacuum sealed) whole hog that would average yield 175 pounds of package pork to your freezer @ $8.75 would cost you $1,531. Costs for a processed a half hog would that average yield pounds of package beef to your freezer @ $9.00 would cost you $792. Costs for a processed (to your specifications & vacuum sealed) whole lamb that would average yield 41 pounds of package lamb to your freezer @ $12.00 would cost you $492.